SAN FRANCISCO /California Newswire/ — Keith Thompson plays an organ program highlighting the popular culture of 1906 San Francisco and its Earthquake at the California Palace of the Legion of Honor, San Francisco, CA on April 22 and 23, Eugene Dong, an independent music producer (www.echoesofheaven.com), announced today. Keith E. Thompson, organist, will mark the 1906 San Francisco Earthquake with concerts of turn of the 20th Century popular music at the California Palace of Legion of Honor on April 22 and 23 2006 at 4 pm. A similar program will be played in late May. Selections such as After the Ball reflect the popular taste of the 1900’s. Charles K. Harris’ After the Ball (1892) marked the beginning of music as “big business” selling 5,000,000 copies. Music publishing was never the same after that. San Francisco’s efforts to refine its culture were rewarded with the appearance of tenor Enrico Caruso in Bizet’s Carmen. Unfortunately, the opening performance was on the evening of April 17, 1906. Caruso wrote that he went to bed satisfied, but awoke at 5 am, to a rocking bed. From the window he saw buildings toppling over and heard women and children crying from the street below. He made his way across the bay to a train and vowed never to return to San Francisco. He never did. Sources noted that Caruso sang Che Gelida Manina several times in the aftermath, perhaps to test his voice. The 1915 Panama Pacific Exposition was held to celebrate the rebuilding of San Francisco. Edwin H. Lemare, (1865-1934) the world’s leading organist, played the Exposition’s organ. By the end of the fair 18.5 million people had visited the fair and Lemare played 121 concerts to almost 150,000 people. 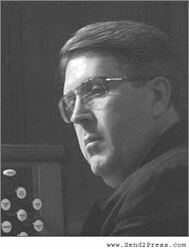 Keith Thompson’s recordings, “A King’s Christmas,” “HymnProvisations” and “Organ Fireworks” are available through www.echoesofheaven.com, and for digital download through Apple iTunes. The CD’s are now also available at Tower Records Classical Annex, Bay and Columbus, San Francisco, CA 94133.